Road Trip Review, Part 1: What Were We Doing? On Sunday, May 1, just as soon as I got home from First Communion Mass and changed my clothes, Emma, Trevor, and I left for a week-long road trip. So many of you were curious about where we were going and what we were doing that it became a source of amusement to keep you guessing. Now that we’re back, it appears some of our friends still insist there must be some method to our madness. Surely we didn’t drive 60-plus hours in seven days for kicks? I assure you: there was very little method. Only madness. Or maybe dadness. It all started in September 2008, when I took Bren (then 10) and Gabe (then 8) on a road trip to the East Coast for a Yankees game, a Yale football game, and various other amusements. 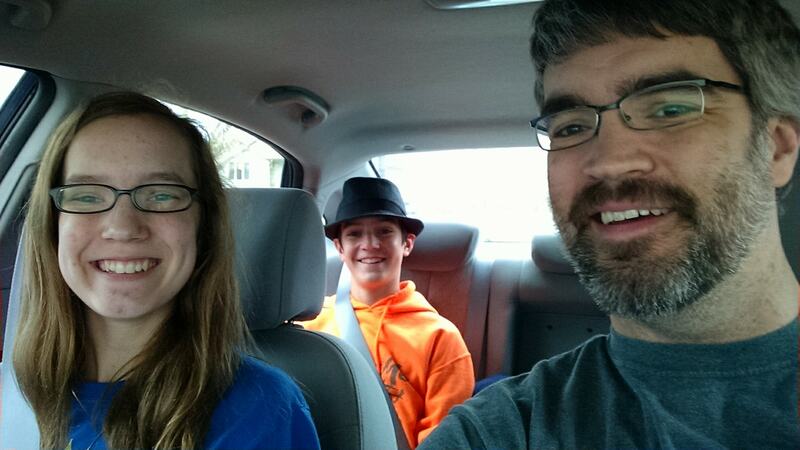 We had a great time, and when we returned (and ever since), Emma and Trevor have reminded me I owed them a trip. We’ve talked about various destinations over the years, but when we got serious about a year or two ago, they agreed: they wanted to go to Florida. They looked at each other and grinned. “Okay!” they said. I’ve been to Florida twice: once as a three-year-old (I have vague memories of visiting family and Disney World — Pirates of the Caribbean, Space Mountain, and Mickey’s big plastic cheek made lasting impressions) and again with the high-school marching band (I mostly recall the bus ride down and back, a big waterpark in Orlando with a crazy steep slide called Der Stuka, a.k.a. the Wedgiemaker, and not knowing the marching music because as a football player I rarely marched). My recollection of the state itself was pretty green ranch country punctuated by neon t-shirt shops, tourist-trap towns, and RV parks. I wasn’t excited to return, until I started planning the trip. Our purpose — our primary goal — was to drive to end of the road and eat good food along the way. That was it. Beyond that, I wanted to see gators in the Everglades; they hoped to see whales or dolphins and new country. Some months after we decided to go south, we connected with an Airedale breeder in Alabama, and thought, God willing, we might come home with a pup. We knew before we left he wouldn’t have puppies for us yet, but we decided to stop through anyway to meet Randy and Pat and their dogs, which also enabled us to rendezvous at an old favorite spot for ribs in downtown Memphis (a place I used to love in a previous life, working for Hanley Wood Marketing and visiting our clients at FedEx). Aside from no-see-ums the first night in the Keys and sunburn the next day, it was a great trip. I’ll share much more in words and photos in the coming days. ← Memento Mori, or Don’t Get Comfortable!